Are you looking for ways to make your classroom or synchronous online lectures and activities more engaging? Try Microsoft Whiteboard! Microsoft Whiteboard is a new virtual, collaborative whiteboard app that can help increase student engagement and participation. Microsoft Whiteboard is a free app that works with both Windows and iOS. It allows users to collaborate in real time, using a virtual canvas. Similar to the traditional classroom whiteboard, instructors project information for students to view; however, the Microsoft Whiteboard app also allows students to interact with the board from their mobile device or computer in real-time. Also, unlike the traditional classroom whiteboard, instructors don’t need to erase information anymore. Microsoft Whiteboard saves board annotations automatically to the cloud. This means students don’t have to write everything down or take pictures of the board. They can simply retrieve the information on their device during or after class as needed. Microsoft Whiteboards can be annotated with a pen, keyboard or by touch. Tools include sticky notes which can be annotated and stacked, and drawing tools such as a ruler and ink to shape feature. Ink to shape takes your freehand drawings and immediately gives them a professional look. You can also easily insert pictures or ink to table charts. Microsoft Whiteboard also makes it easy to resize or copy content within or from your board as well as switch between boards. Finally, Microsoft Whiteboard’s bird’s eye view option, allows you to zoom out or zoom in on displayed content as needed. This can be particularly helpful when working with numbers, such as financial statements. The collaborative nature of Microsoft Whiteboard makes it a useful technology tool for classroom brainstorming activities, mind-mapping, group work-out problems or integrating collaborative approaches to problem-solving and decision-making activities. Best of all, Microsoft Whiteboard is easy to use. Just download the appropriate app (Windows or iOS), then set up or sign in with a Microsoft account (Outlook, Hotmail, Live, Xbox, Office 365). To start a collaborative, interactive session, simply select the “Invite” button, then write or type the invitee’s name or generate a link to share with the class. 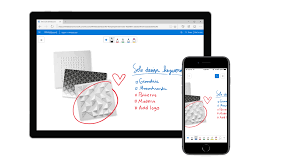 To learn more about Microsoft Whiteboard, watch the overview video at https://www.youtube.com/watch?v=hG91PYYPDto. Then visit https://products.office.com/en-us/microsoft-whiteboard/digital-whiteboard-app to get started with your free account.